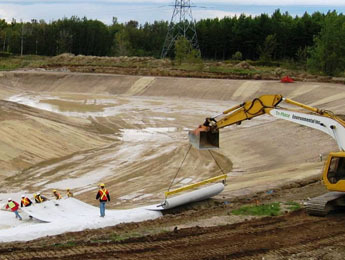 Tri-Phase was retained to provide PCB remediation and demolition services for a digester containing 1000 cubic meters of PCB-contaminated sludge. Prior to commencing any work, Tri-Phase located, cut and capped all utilities within the work area. The scope of work included the removal, dewatering/solidification, transport and disposal of the PCB contaminated sludge from the digester and attached gallery as well as any remaining mechanical equipment. Following the removal of contaminated material, the walls and base of the digester were power-washed and decontaminated, while collected wash water was treated on-site. 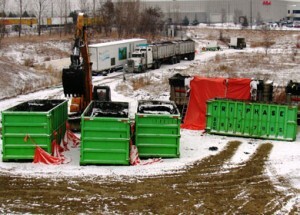 The digester was then demolished, and concrete was crushed on-site. In addition, Tri-Phase constructed, maintained, operated and then decommissioned two decontamination facilities — one for trucks and equipment and one for workers. 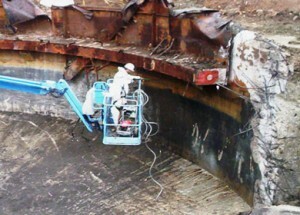 This practice ensured the removal of residual PCB contamination that may be present, prior to their removal from site. All vehicles leaving the work area were washed/decontaminated and water contained in temporary holding tanks pending testing, treatment and disposal. Tri-Phase also provided the client with a detailed demolition plan, waste management plan, schedule and budget breakdowns. All work was completed on time and within budget.